Every day, we urinate nutrients that can fertilize plants that could be used for beautiful landscapes, food, fuel, and fiber. Instead, these nutrients are flushed away, either to be treated at high cost or discharged to waters where they over-fertilize and choke off aquatic life. Liquid Gold: The Lore and Logic of Using Urine to Grow Plants tells you how urine, which contains most of the nutrients in domestic wastewater and usually carries no disease risk, can be utilized as a resource. 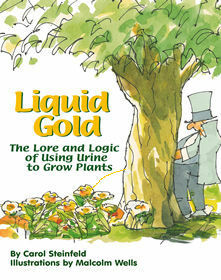 Starting with a short history of urine use, from ritual to medicinal to even culinary, and a look at some unexpected urinals, Liquid Gold shows how urine is used worldwide to grow food and landscapes, while protecting the environment, saving its users the cost of fertilizer, and reconnecting people to the land and the nutrient cycles that sustain them. That's real flower power!